Item is lightly used and has been tested to confirm that it works as it should. Includes 115V AC power supply and serial cable. No printed manual is included but a copy may be downloaded here instead. The Broadcast Tools DAS 8.4 Plus provides AES/EBU digital audio routing/switching of any one of eight AES/EBU inputs to any/or all four AES/EBU outputs. The DAS 8.4 Plus may be used in Multicast applications, where an AES enabled EAS device assigned to input eight is routed to all four outputs via a contact closure or serial command. When the alert/test is completed, the DAS 8.4 Plus will return to its previous I/O configuration. The DAS 8.4 Plus may be controlled via front panel switches, contact closures, 5-volt TTL/CMOS logic and/or the multidrop RS-232 serial port. The front panel is equipped with input and output selection pushbuttons, output assignment LED’s, sample rate LED indicators and a headphone amplifier with a front panel T/R/S/ jack and level control. Additional features: 96 KHz AES receiver, a 24-bit D/A converter with analog balanced stereo output, headphone amplifier and 16 x 16 GPIO port. Installation is simplified with plug-in euroblock screw terminals. 1-RU chassis. Routing type switching, any one input may be assigned to any/or all outputs. Digital Error and stereo 10-LED meters; adjustable analog Silence Sensor/AES Digital error alarm delay and restore duration. Analog silence sensor sensitivity is factory set at -30db. Front panel input selection switches are provided for each input channel with separate output indicator LEDs. 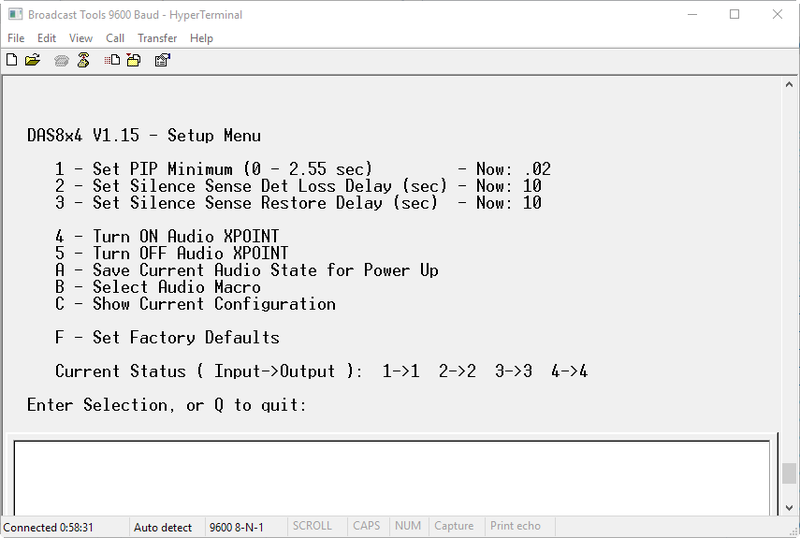 Power-up selection of inputs to outputs, mute or last source selected. Most configuration options via rear panel dipswitches. 16 input GPI port (Remote Control or PIP) with LED indicator. 16 open collector channel status outputs or programmable via burst commands. Remote control of front panel functions and status. Multi-drop RS-232 serial port with data activity LED. Multiple units may be looped-thru to expand outputs. Plug-in euroblock screw terminals for ALL connections.